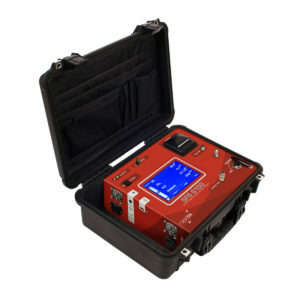 The Rapidox SF6 6100 Portable is designed to test the quality of SF6 in MV & HV gas insulated electrical equipment. The analyser is pre-programmed with all current IEC and CIGRE test configurations, with the ability to create customised test parameters. Exceptional accuracy and stability are provided when measuring the purity of SF6 gas, through specially selected sensors. A output nozzle allows for the analyser to be attached to the Rapidox Gas Recovery Bag, ensuring that all sampled SF6 gas is recovered. For the power transmission and distribution network, SF6 technology remains essential. To protect personnel, equipment and the environment regular SF6 analysis should be adopted within the maintenance schedule. The early identification of any decomposition products and moisture within the SF6 gas will help avoid unnecessary shutdowns, outages and failures, in addition to reducing maintenance expenditures. The modular configuration allows for up to eight compatible gases to be analysed simultaneously with one analyser. Internal SF6 gas pressure is recorded and logged by the analyser. All measured gases are analysed and data-logged simultaneously with only a few minutes required to achieve a stable reading. In order to accelerate the time taken in-between dew point readings, a unique Rapidri system is fitted to analysers measuring H2O. When not in use the sensor can be isolated via the ‘Run – Storage’ valve. Other measurable gases include H2O (dew point), SO2, HF, O2 & CF4. Due to the instruments modular design, a number of configurations are available in order to suit a variety of application requirements. The CP11 is an economical handheld instrument measuring multiple parameter simultaneously including humidity temperature and CO2 . With psychrometric calculations of dew point and wet bulb temperature also available. 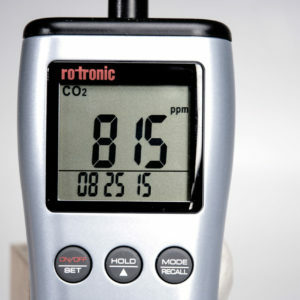 The CO2 handheld can be set as required and data can be downloaded, saved and analysed using the ROTRONIC SW21 software, software key is provided and can be downloaded for installation on your computer. This instruments offers unbeatable value for money, equipped with a stable humidity sensor HYGROMER® IN-1. Unit are typically used for indoor air quality including, monitoring in underground car parks (safety), Leak monitoring in filling plants (safety). 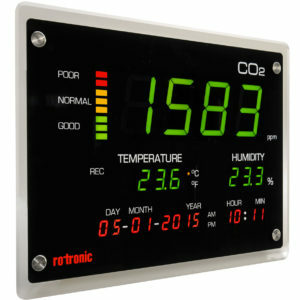 Measures and logs CO2, relative humidity and temperature. Maximum, minimum and average value display. Software key for SW21 included downloading software from website. 18,000 data point memory for CO2, humidity and temperature values. Adjustable auto power off function. 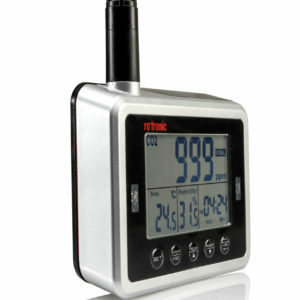 The CF1 series is a reasonably-priced CO2 measurement transducers with integrated humidity and temperature measurement. The transducer can be adjusted and calibrated for the humidity and CO2 ranges. Altering the scaling is a easy, with the Rotronic SW21/HW4 software. 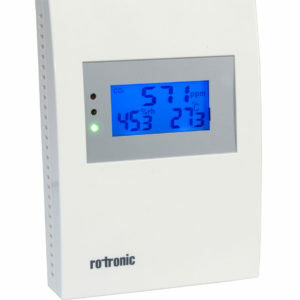 This unit is exceptional value for money with a stable Hygromer® IN1 humidity sensor. Its elegant design fits in perfectly in offices, living-rooms, public buildings, etc.